I have wanted to visit this ancient well since I first saw Gary Branigan's photograph in his book "Ancient and Holy Wells of Dublin". The large boulders used in the construction of the well house give it a wonderful megalithic appearance. I waited until autumn to visit in the hope that the vegetation around the well may have died away. Unfortunately I was a bit too early, but will call back again soon. A series of stone steps lead you down to the well. 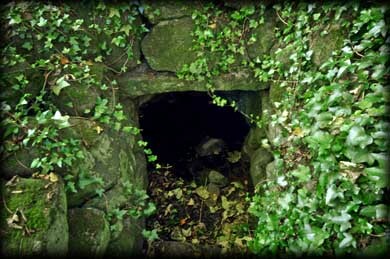 Built into the wall on the right is a large single bullaun stone, pictured below. The well is associated with St Mobhi or St Movee, a hermit who died in 630AD, about a century later than St Mobhi of Glasnevin. 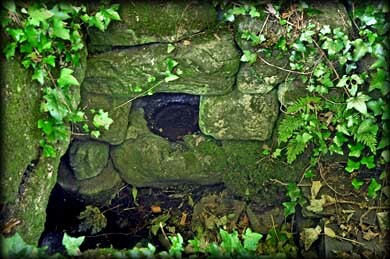 One of the stones around the well is said to bear cup-marks, but I could not locate it on this visit. 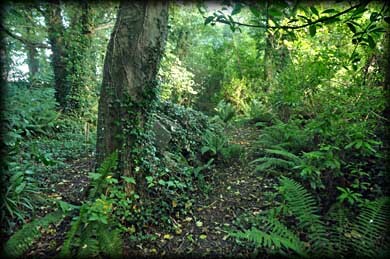 The graveyard to the west of the well is believed to be the site of St Movee's Hermitage. Situated: heading for Skerries on the R127 turn left just after the right turn for Baldongan Castle. 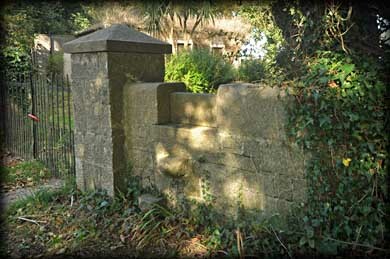 After 750 metres you will see a stile at Milverton gate lodge. This is a private estate so please ask for permission before visiting. Discovery Map 43: O 2248 5937. Last visit Oct 2013.